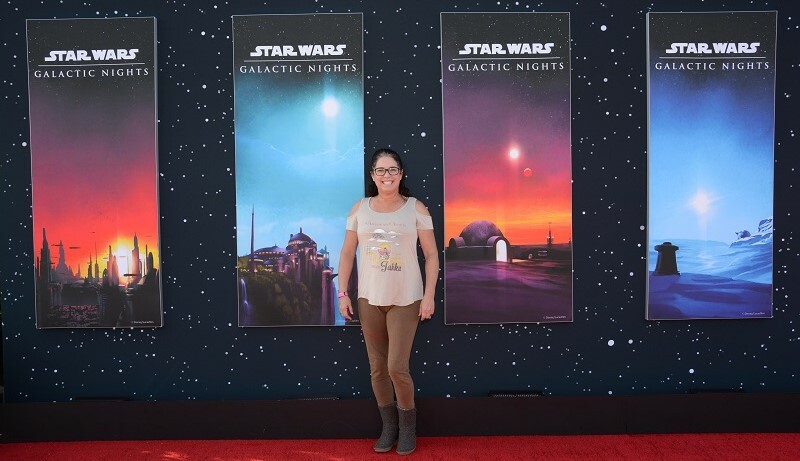 After debuting the five-hour ticketed special event in April 2017 in conjunction with the Star Wars Celebration Orlando convention, Disney World hosted the second ever Galactic Nights at Hollywood Studios on Saturday, December 16, 2017, to celebrate the theatrical premiere of The Last Jedi. Once again Star Wars fans took the opportunity share their collective sense of excitement and enthusiasm for the galaxy far far away. It is impressive how quickly the Disney World staff is able to retheme Hollywood Studios to take on a Star Wars flavor throughout the park. Some adjustments were relatively easy, like using the familiar Star Wars themes as the ambient music playing from the numerous concealed speakers. Others were more complex, such as adding electronic signage and opening sections of the park normally closed off to guests. 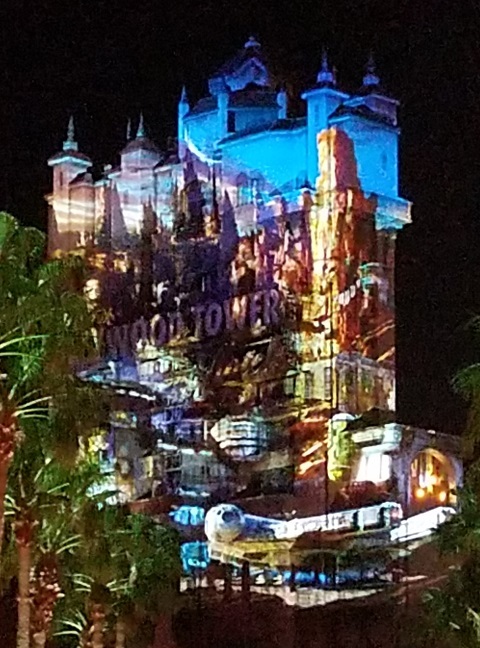 Perhaps most impressive, and visible from much of the park, was the use of light projections to turn the Hollywood Tower Hotel into the display platform for Star Wars imagery and video, from the feature films and otherwise. While walking Sunset Boulevard, the accompanying audio enhanced the visual experience. 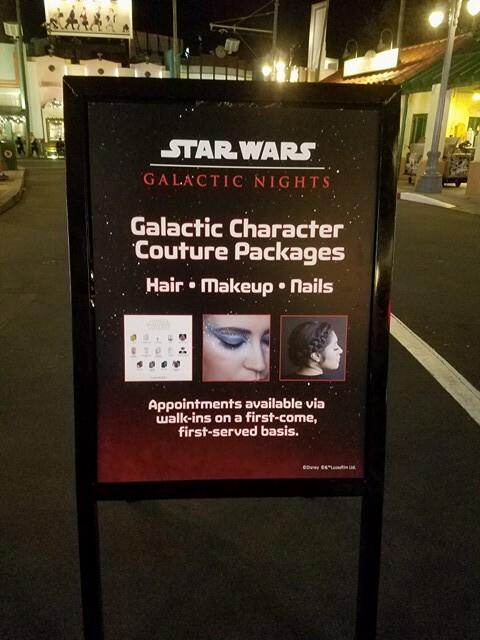 Galactic Nights offered a wide variety of exclusive food, drink, and merchandise. With fifteen different food options, each sold from at least two vendor locations, we weren’t able to try them all. 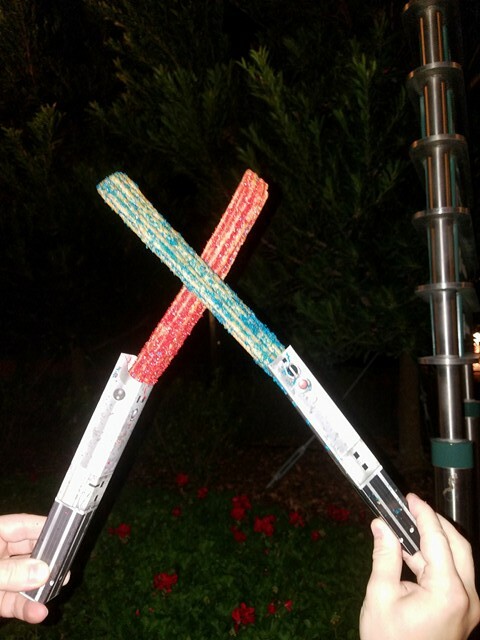 We particularly enjoyed the ribeye steak puff, inspired by Han Solo, and the crab duo, inspired by the Gungans – as well as, of course, the lightsaber churros. For the more adventurous palate, Jabba the Hutt’s frogs legs, pork belly, and black ink noodles is a memorable dish. Familiar from Star Wars Weekends in years past, the alcoholic concoctions included blue Lightsaber Margaritas and green Swamp Juice. 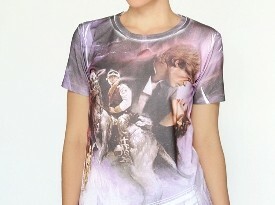 The special merchandise for Galactic Nights focused on shirts, hats, and pins, while Disney World annual passholders could purchase exclusive Galaxy’s Edge preview shirts and pins, as well. 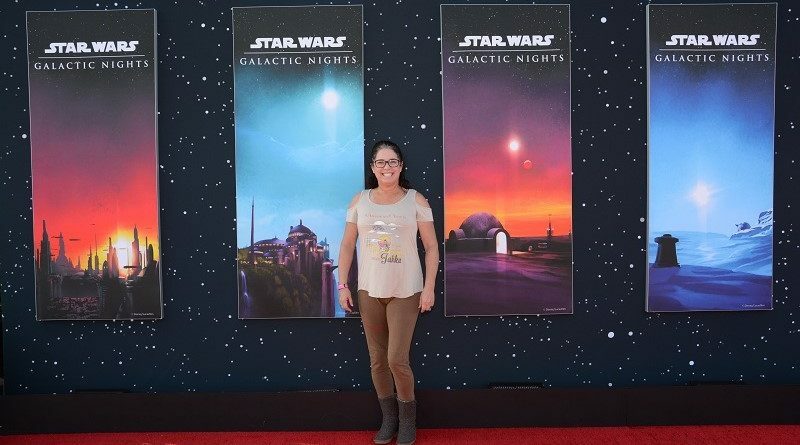 Once again Galactic Nights provided a fun combination of photo backdrops and “scavenger hunt” to encourage fans to amble their way through most of the park. 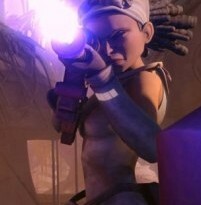 From the more recently released stories, the Star Wars locations let fans pose at Ahch-To, Jakku, Jedha, and Malachor from Star Wars Rebels; more nostalgic fans could go for the wampa, rancor, and Emperor’s Throne Room from the Original Trilogy. The final backdrop was the Millennium Falcon, docked at the frontier outpost of Batuu, home to the upcoming Galaxy’s Edge expansion – and now featured as the ending of the Crait sequence on Star Tours. Fans not interested in waiting in line for a picture at a particular location could stop by and obtain a sticker from a cast member, with images such as a porg, luggabeast, or K2-SO. All eight stickers combined to form the key art for the event, also shared as a poster giveaway as fans departed the park at the end of the night. Held four times during the event at the Epic Stunt Theater usually featuring Indiana Jones, “Inside Star Wars: Galaxy’s Edge” provided a sneak peek at the progress and design principles of the theme park land. The key leaders from Disney Imagineering and Lucasfilm shared new details, and even some never-before-seen photos, on what fans can expect when the area opens in 2019. Check out Tricia Barr’s report on the panel for more information. Like other ticketed events at Disney World parks, such as the Very Merry Christmas party held select nights in December at Magic Kingdom, wait times for the rides at Hollywood Studios were essentially nonexistent during Galactic Nights. Even Star Tours, naturally the high-demand ride during this event, consistently involved a line of ten minutes or less throughout the night. The only ride modified for Galactic Nights was the Rockin’ Roller Coaster, which took on a Star Wars reskinning by playing John Williams themes instead of Aerosmith; the interior lighting on the California highway signage also was turned off, allowing Star Wars images to be projected on the walls for riders to zoom past. The conclusion of Galactic Nights kicked off with an epilogue hosted by Warwick Davis, who narrated over fan pictures curated from the evening’s social media hashtags. Then the Chinese Theater at the center of Hollywood Studios became the backdrop for the Star Wars: A Galactic Spectacular light projection show. 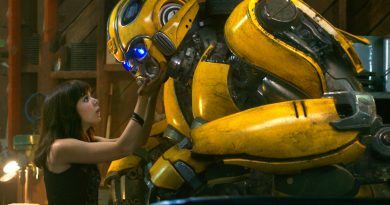 Though much of it was familiar to fans who’ve seen it previously, some new additions were notable – including an hilarious cameo by a porg. Disney World has not yet announced the next Galactic Nights event, but keep your eye on social media or the Disney Parks Blog for the latest updates. With Solo: A Star Wars Story coming to theaters in May 2018, perhaps another movie premiere-themed event will be in store for fans.